At the beginning of the Country’s involvement in World War II, the Schmid boys and Notre Dame intersected. Tom, Jim, John, and Bill all attended Notre Dame during a period of Notre Dame’s dominance in football, winning a series of National Titles the Country had not seen since the days of Knute Rockne. Many say that Notre Dame’s fortunes in football begin with Rockne’s first undefeated season at Notre Dame in 1919, which ironically overlapped with the founding of Crescent Electric. It is little wonder, then, that Crescent’s founder, Titus, turned to Notre Dame to educate his boys, as both Crescent Electric and Notre Dame began to make big news about the same time. As Crescent reaches its 100th anniversary and begins a new century of service to its customers, Notre Dame’s fortunes too are again on the rise. For the first time in the brief 5 year history of the College Football Playoffs, Notre Dame is in the hunt for its 12th National Title. This year registered one of only a handful of undefeated and untied regular seasons at Notre Dame, not unlike the atmosphere and expectations that awaited the Schmid boys when the first of them arrived on campus in the fall of 1938. Tom was the first to enroll. The Schmid boys’ academic adventures at Notre Dame did not begin without incident and would not have commenced without persistence and a little bit of creativity on Tom Schmid’s part. At the beginning of the Country’s involvement in World War II the Schmid boys and Notre Dame intersected. 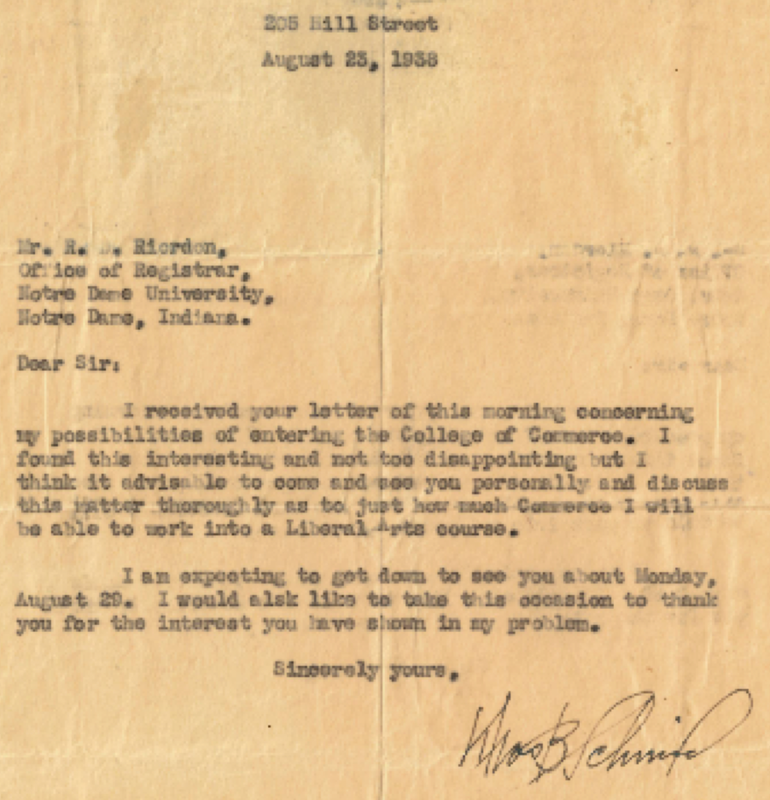 The Schmid boy’s academic adventures at Notre Dame did not begin without incident and would not have commenced without persistent and a little bit of creativity on Tom Schmid’s part. Tom was the first to enroll. The Schmid boys’ academic adventures at Notre Dame did not begin without incident and would not have commenced without persistence and a little bit of creativity on Tom Schmid’s part. As set forth on the letter below, Tom’s initial application for transfer into Notre Dame’s school of business was denied (a practice denying sophomore and junior transfer student’s admittance to the school of business that continues to this day). With a bit of ingenuity Tom studied commerce and economics in the College of Arts and Letters at Notre Dame to prepare him for his ultimate leadership role at Crescent. Here is his fall semester 1939 registration notice issued in April, 1939 noting his residence as 128 Dillon Hall. Dillon Hall remains a coveted dorm assignment to this day. Tom volunteered and was named Vice President of the Iowa Notre Dame Club when he was a senior. This tradition of service to the community began at Notre Dame, and was followed by each of the Schmid boys (Tom, John, Jim, and Bill) and became part of the fabric of the Schmid family and Crescent Electric. John Schmid followed in his big brother Tom’s footsteps and enrolled at the University of Notre Dame in the fall of 1939. The photo to the left is a photo of John on campus when he was a student. John Schmid was an ardent fan of Notre Dame his entire life. 2013 of some of the Sullivan Family (grandchildren of Bill Schmid) joining their Great Uncle John to watch Notre Dame and cheer their favorite team on to victory! This is a picture of Jack Schmid (son of John) and his son John (grandson of John Sr.) tailgating at a Notre Dame football game in 2015. And, this tradition of cheering on the team to victory continues. 5thgeneration Schmid member, Addi Sexe, was cheering on her favorite team for her Halloween costume this year! Brother Jim followed shortly thereafter, enrolling at the University of Notre Dame in the fall of 1941. Jim Schmid was named Senior Manager for the undefeated Notre Dame football team. He served famous but demanding Coach Frank Leahy, the winningest and some say the most exacting coach in the history of Notre Dame. Jim appears to the right in this extremely rare video footage of Coach Leahy conducting practice with the offensive linemen of Notre Dame, who blocked for Heisman trophy winner Angelo Bertelli (Heisman ’43). For Jim’s service to the team, which included booking trains to the University of Southern California and arranging other team transportation, and lodging for away games (quite a responsibility for a senior business major back then), Jim received a handsome $10 Manager’s Credit as evidenced below. Apparently his football manager duties kept him out past curfew, and he was confined to the dorm for a week as penance. For all his hard work, however, Jim earned a monogram, and his name is engraved in the hall of monogram winners at Notre Dame alongside the many famous players of those many undefeated seasons in the 1940’s. Notre Dame announced their monogram awards on December 15, 1943. Jim Schmid received a monogram along with then sophomore Johnny Lujack and senior Angelo Bertelli, who both won the Heisman trophies. During his senior year in 1943, the Marine Corps activated Bertelli after six games of Notre Dame's 10-game season. In the six games Bertelli started in, he threw 36 passes, completing 25 with 10 touchdowns. Bertelli's six-game 1943 performance was enough to win the Heisman Trophy earning 648 votes. During Bertelli's three seasons, Notre Dame lost only three games. In 1943, Notre Dame won 43 to 5 on average. Lujack’s career at Notre Dame was interrupted by two years of military service.Lujack attended Notre Dame, where he was given a scholarship by Frank Leahy, from 1942 to 1943 and then 1946 to 1947. His career was interrupted for two years by World War II after his sophomore season, where he served as an officer in the United States Navy. His time in the Navy was spent hunting German submarines in the English Channel as an ensign. Youngest brother, Bill Schmid, enrolled at the University of Notre Dame in 1943 during the height of the war effort. The Notre Dame campus was awash with Navy and Marine cadets; Notre Dame was saved from looming bankruptcy during the height of the war when Notre Dame was paid to educate Marine and Navy officers. Bill graduated in two and a half years as all universities ran year-round during the war. This is the graduation picture of Bill when he graduated from Notre Dame in 1946 with a degree in Business Administration. Isaac Daugherty, Notre Dame Alumnus of 2016, and a great grandson of Titus Schmid, interviewed Bill Schmid, his grandfather for the video above. The video, part of a larger piece documenting the allegiance between Notre Dame and the Naval Academy, was produced when Isaac was a seventh grader in 2010. The tradition of Notre Dame and Navy continues today. Notre Dame plays against Navy in football every year. While Notre Dame is usually victorious, this isn’t always the case. Below, Navy shipmen enjoy tailgating with Michael Daugherty (son-in-law of Bill Schmid) and Notre Dame Law Alum ’82. 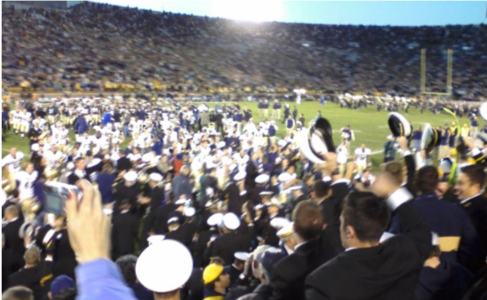 That same day, Navy fans spill onto the field to celebrate their victory after the game, the first Navy victory over Notre Dame in over 40 years. Below right, John and Jim Schmid returned to Notre Dame for the Navy game in 1947. Below left is a picture of Tom and Libby Schmid, Jim and Mary Schmid, and two of their friends back on the Notre Dame campus for a football game in 1964. Tom Pollei, Class of 2019. At right we have 3 generation of Notre Dame class rings, united at Emma Daugherty’s graduation in 2008. The other hands belong to her father Michael Daugherty and her grandfather Bill Schmid. The long Schmid family connection to Notre Dame fits well with the fabric of the family and Crescent Electric. This is the deep-rooted commitment to be in service to others, to strive for excellence, and to remain loyal to those visions.